The first proof commemorative silver dollar to be issued by the US Mint in 2010 was the 2010 American Veterans Disabled for Life Proof Silver Dollar. 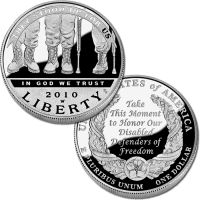 The coin honors all of the individuals who suffered a disability as a result of their service in the armed forces of the United States – from those who died as a result of those injuries, to those who survived and later passed away, and finally to those who are still alive but forced to live with the disability caused by their service. A portion of the original sale from the US Mint for each of these coins will be forwarded to the Disabled Veterans’ LIFE Memorial Foundation to construct the American Veterans Disabled for Life Memorial in Washington, D.C. The Mint strikes the commemorative coins for numismatic value even though they do contain a face value as legal tender. The Mint collects a surcharge on the sale of each commemorative coin which is forwarded to an organization chosen by congress when it authorized each coin. Each Disabled for Life Coin is struck from 90% silver and 10% copper . The US Mint released the 2010 American Veterans Disabled for Life Proof Silver Dollar on February 25, 2010. An introductory price of $39.95 was offered by the US Mint for the Disabled for Life Proof Coin when first released. Several weeks later the price changed to $43.95 for each coin. Each of these coins were struck at the US Mint’s West Point facility and carries the appropriate "W" mintmark. 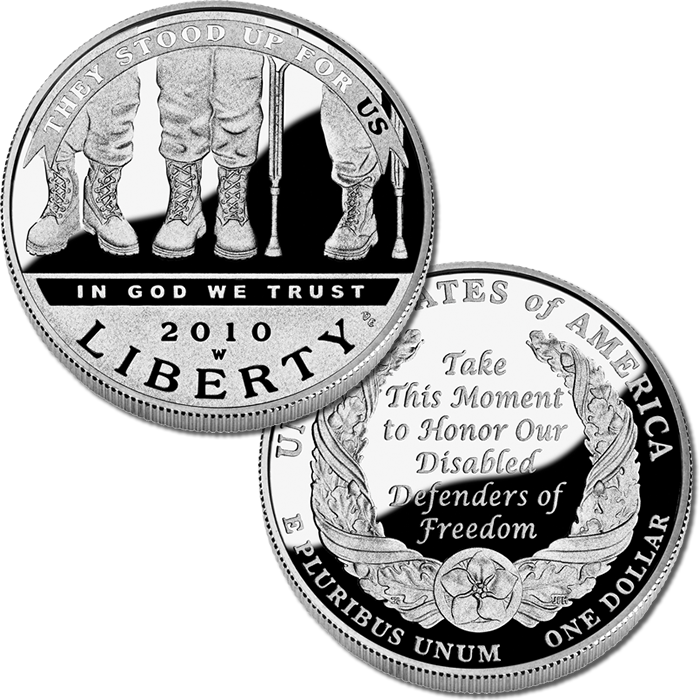 The obverse of the Disabled For Life Silver Dollar contains an image of the legs and boots of three disabled veterans. One of the veterans is shown on crutches. It is the work of United States Mint Sculptor-Engraver Don Everhart. The reverse shows a wreath of oak branches wrapped with a ribbon and a forget-me-not flower is found on its base. The wreath encircles the inscription "Take This Moment to Honor Our Disabled Defenders of Freedom." It was designed by United States Mint Artistic Infusion Program Master Designer Thomas Cleveland and engraved by United States Mint Sculptor-Engraver Joseph Menna.